Islam Around Us: Egyptian army bombards Sinai militants. 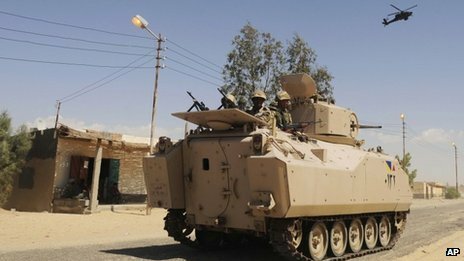 BBC News | 07 Sep 2013 :: The Egyptian army has attacked militants in the Sinai peninsula using tanks and helicopters, killing or injuring at least 30 people. Tanks, armoured vehicles and troops were deployed in towns along the border with the Gaza Strip, eyewitnesses say. The operation is said to be the biggest of its kind in recent years in Sinai. Elsewhere, soldiers discovered mortars and other explosives on a railway line near the Suez Canal, the state news agency reports. There have been frequent attacks on pipelines and security forces since the uprising that toppled former President Hosni Mubarak in 2011.